With fierce roars and sharpened claws, the Trump regime announced it would “drive Iran’s oil exports to zero.” That was supposed to have happened by the end of the first week of November 2018. But as it turned out, like all of Trump’s insane threats, this, too, was meaningless. Shortly before the “most biting sanctions ever imposed” were scheduled to come into effect, Trump exempted Iran’s leading oil customers! The list of countries that buy Iranian oil begins with China, India, and Korea, which together purchase almost half of the total output. Next on the list are Turkey, Italy, and Japan. All six countries — and a few others — have been exempted from Trump’s sanctions. Why would Trump tear up his own sanctions? Because few if any of Iran’s customers were planning to respect them. As Bloomberg reported on August 2, China — by far Iran’s largest oil recipient — forcefully rebuffed Trump’s request to stop buying Iranian crude. Tehran’s second biggest oil customer is India. In early October, one month before Iran’s oil trade was supposed to be driven “to zero,” India announced that it too would ignore US sanctions. In July, before China and India rebuffed Trump, Turkey had led the way in rejecting the American plan to sanction Iran. Turkish Foreign Minister Mevlut Cavusoglu called the planned sanctions “inappropriate.” Then in early November, shortly before Trump issued the exemptions, Turkish President Recep Tayip Erdogan reiterated his country’s refusal to abide by US sanctions, saying “we do not want to live in an imperialist world.” By adding Turkey to its list of exemptions a few days later, the Trump regime seemingly admitted that it was no longer capable of maintaining that imperialist world. 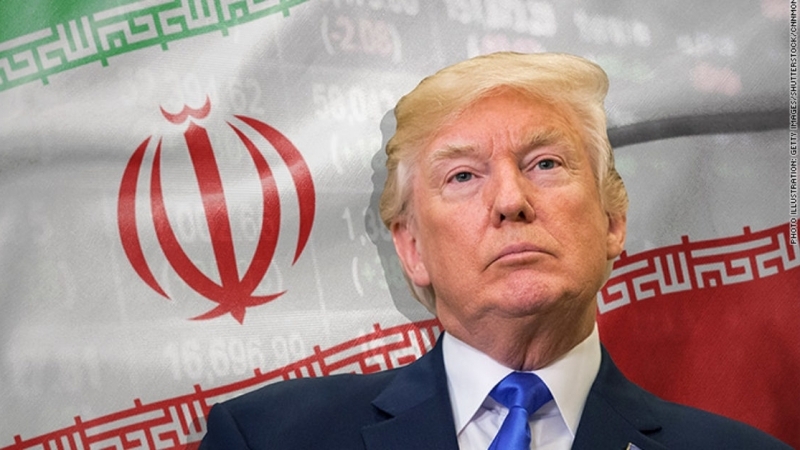 Even US-occupied Europe, which usually plays lapdog to the hectoring American hegemon, has vociferously opposed Trump’s Iran sanctions. 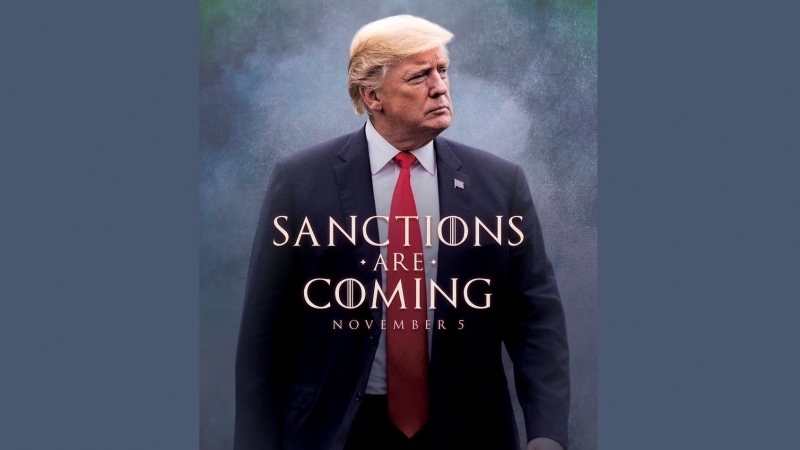 Though European governments have not succeeded in forcing their biggest corporations to violate Trump’s sanctions, they have taken steps that threaten to render the sanctions ineffective in the future. The Europeans have begun bundling smaller banks’ and corporations’ transactions with Iran so they can be sent via Europe’s central banks, which are (they assume) too big for Trump to sanction. At the same time the Europeans are initiating their own clearing mechanism outside of the US-dominated SWIFT system. These moves, which parallel efforts of Russia, China, Turkey, and other nations to exit the dollar-denominated international trading system, could finish off an already declining US empire. The Rahbar of Iran, Imam Seyyed Ali Khamenei is a thoughtful, sincere, spiritual man of his word — the polar opposite of Trump. He knows that Trump is a bloated narcissistic windbag whose words are full of proverbial sound and fury, signifying nothing. One simply cannot imagine these two men meeting, or even being together in the same room; it would be like matter meeting antimatter. An artist’s rendering of what US sanctions are all about: not principle but national interest at a given moment in time according to the perceptions of the transiently wealthy and powerful. 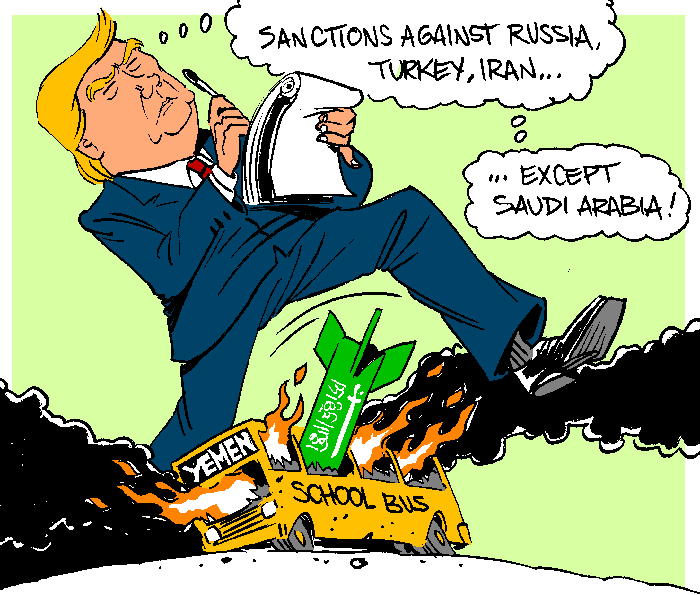 So long as you endorse the expansion of US geopolitical influence and dominance by any means necessary, it doesn’t matter if you starve an entire country to death (Yemen), if you murder one of your own citizens in cold blood at your own embassy (Khashoggi), if you proliferate terror networks all around the world (ISIS, al-Qaeda), if you abandon the indigenous residents of the Holy Land after they were ethnically cleansed (Palestinians), and if you incite sectarian wars in the region in which millions get displaced and hundreds of thousands lose their lives and livelihoods (Syria, Iraq). But what John Kerry may not understand, or may not wish to understand, is that Iran is not just waiting out Trump, it is waiting out the whole US-Zionist empire. As whistleblowing former World Bank economist Peter Koenig says, “the US dollar is rapidly losing its status as the world’s reserve currency. When some 20 years back more than 90% of all reserves were held in US dollar denominated securities, today that figure has shrunk to less than 60% — and is going down as we speak.” Eventually (perhaps within a 10–15 year time frame) demand for the dollar will crash as dollar-holders realize that America’s debt, which has exploded well past 100% of GDP, is unrepayable — and rush for the exits, hoping to avoid being the last one holding worthless American currency. That moment will mark the end of America’s ability to pay for its military machine, which costs more than the next eight countries’ militaries combined. When the US is forced to close its foreign military bases and bring its troops home, the Muslim East will change dramatically. Regimes that only exist because they are propped up by the US, notably “Saudi” Arabia and Israel, will likely collapse. While Islamic Iran waits out Trump and the American empire, it is in some ways being strengthened by the very sanctions designed to hurt it. Though ordinary Iranians do feel the pain of pinched pocketbooks, shortages of medicines, and medical equipment, and less-than-optimally safe airliners, the Iranian nation as a whole is being forced to increase its productivity rather than depend entirely on oil earnings and other raw materials exports. The result is a “resistance economy” geared toward domestic manufacturing rather than raw materials exports exchanged for foreign manufactured goods. That stimulates Iran’s manufacturing sector in the same way that tariffs would. And though European investors pulling out of Iran’s automobile industry this year has been painful, in the medium to long term a more Iranian-run industry, unburdened by debt, could be poised to make big gains, and keep the profits in Iran, when Trump’s sanctions fade. As it builds its resistance economy, Iran is also accumulating moral capital and worldwide support. Iran’s principled opposition to Trump plays well in a Trump-loathing world. Its courageous refusal to surrender in the face of vicious and criminal sanctions that violate international law is appreciated around the globe. 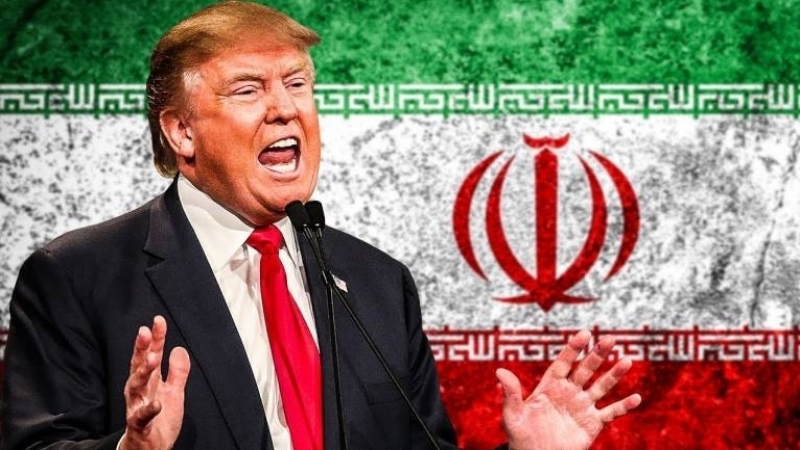 It has been said that the best possible public relations strategy is to choose a deeply unpopular enemy, but Iran has not even had to make such a choice, because the highly unpopular Donald Trump has done the job himself. When the story of the emerging multipolar world is written, Iran will be cast in a heroic role. 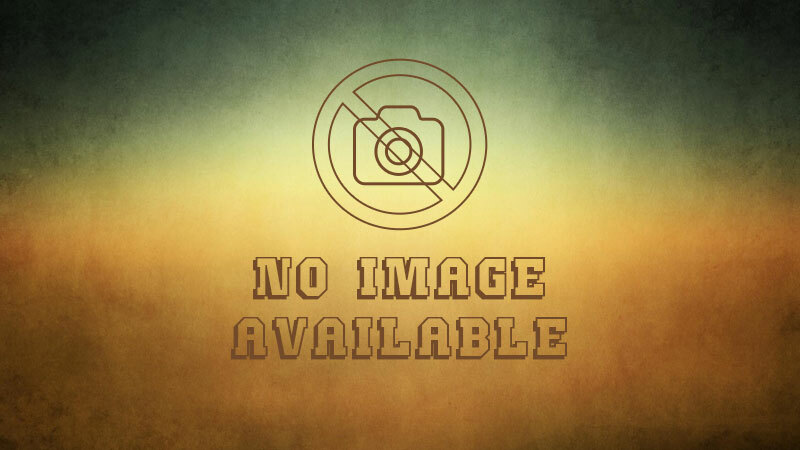 And somewhat later, when the story of the 15th century AH Islamic Awakening is written, the Islamic Republic of Iran will likewise be viewed as a nation whose top leadership forged an uncommonly principled example of Muslim self-determination.